The Coming is steep and sustained up a big right-facing corner. It’s a great climb for the well-rounded climber with a bit of everything from chimney to steep hands to tricky liebacking to knobby face. 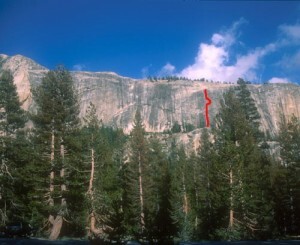 This is a stellar 1960s route that was established by the master Tuolumne free climbers of the era. Which SuperTopo guidebooks include a topo for The Coming?